Casa Defra and in particular the Cielo family have once again produced a great tasting Prosecco Frizzante. The family pride themselves on sustainable viticulture and the care they take in production pays dividends. The Frizzante is the semi-sparkling type of Prosecco but doesn't lack in flavour. The wine comes presented in one of our 'Happy Birthday' branded wooden gift boxes so it really gets the birthday message across. 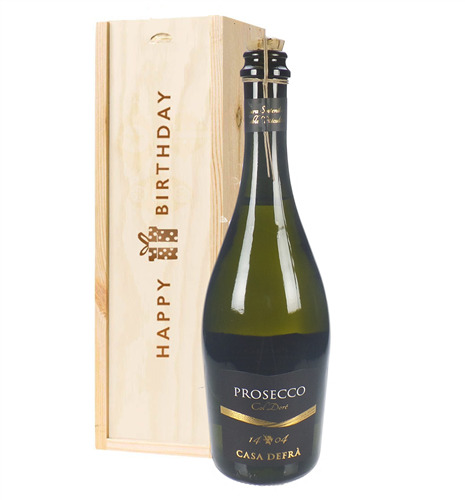 Sending someone a birthday gift couldn't be easier and we have a nice collection of Prosecco birthday gifts right here for you. 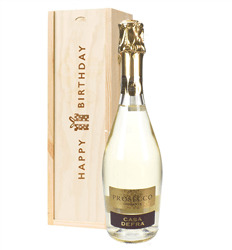 Prosecco is extremely popular and we are always adding to our range. Order online or by phone and we will deliver to the address of your choice, carefully packaged with your special gift message and on the delivery date you choose too.